Workers at Opel's Bochum plant are worried about the future. FRANKFURT -- Konrad Goretzka drops his son Leon off for training at German soccer club VfL Bochum most mornings before driving two miles to the Opel car factory where he has worked as an electrician for more than three decades. With Opel's parent General Motors Co. announcing on Wednesday a cost-saving pact with PSA/Peugeot-Citroen, Goretzka says he's hoping the soccer sessions lead to a professional contract so the 17-year-old won't be left relying on the plant for a job. "I would never advise him to start here," said Goretzka, 51, who began at Opel as a trainee in 1978. The GM-PSA accord will entail job cuts at the two carmakers, a person familiar with the deal said Feb. 28, raising doubts about the future of the Bochum plant in Germany and one in Ellesmere Port, England, operated by Opel's sister brand Vauxhall. Both factories have been in limbo in recent years amid speculation that they would be closed. Now they may be rivals for survival. While workers at the two plants wait and worry, for the two automakers, job cuts will be one way to turn around a long string of bad results. PSA's automotive division lost 92 million euros ($123 million) in 2011. GM's Europe operations have lost $15.6 billion since 1999. That has been a drain on GM's good news in its other markets. Last year, GM regained the title of the world's No. 1 carmaker and reported a record annual profit of $9.2 billion. With European auto demand forecast to drop again in 2012 for the fifth straight year because of the sovereign debt crisis, the companies decided they had to move now. The tension at the plants in Germany and the U.K. shows the increasingly global and competitive nature of labor as corporate and national boundaries break down. In what may be a sign of things to come, Vauxhall said on Thursday it would cut some jobs as it seeks to avoid a buildup of unsold cars. About 150 posts may go. Opel has a total of 40,000 workers spread across 11 European plants. Bochum and Ellesmere Port are the oldest and therefore in theory the least efficient and most likely to be closed, said Ferdinand Dudenhoeffer, director of the Center for Automotive Research at the University of Duisburg-Essen. In Ellesmere Port, 82-year-old Harvey Young, who worked at the plant between 1963 and 1987, said closure fears are pitting U.K. workers against their German counterparts as GM's European sites vie for a viable slice of shrinking production. Vauxhall may be vulnerable because its last home-grown design, the Viva sedan, was produced in 1979, with subsequent models based on rebadged Opels originating in Germany. "They've got the plants competing against each other," Young said. "All the factories are at each other's throats. It's a bad thing. When I first started at Vauxhall, it was all self-contained. Then they started shifting things around." Political interference and strong unions have hampered both companies from shutting factories and laying off workers to rein in costs. French Labor Minister Xavier Bertrand warned PSA CEO Philippe Varin last week against cutting jobs as a result of the GM deal. President Nicolas Sarkozy, who's running for re- election this year, summoned Varin in November to ask him to reconsider plans to cut as many as 6,800 jobs, including temporary staff employed by partners. German Chancellor Angela Merkel has also shielded German factories. She brokered the sale of Opel to protect jobs. The deal ultimately fell apart when GM backed out in November 2009 after exiting bankruptcy. A restructuring agreement stemming from then prohibits plant closures until 2014. Vauxhall sold almost 235,000 cars in Britain last year, making it the country's second-biggest brand after Ford Motor Co., with a 12 percent market share. Vauxhall was spurred by models including the Astra compact, made in Ellesmere Port. Opel's German sales were higher at 285,000, but amounted to only 9 percent of the market, with Opel trailing in fourth spot behind Volkswagen, Daimler and BMW. GM bought Vauxhall in 1925, four years before it acquired Opel. The U.K. business built its first car in London's Vauxhall district in 1903 before moving to Luton, north of the capital, two years later. That site remains its base and makes only vans. In Bochum, situated between Essen and Dortmund in the Ruhr valley, Germany's industrial heartland for two centuries, workers have accepted pay freezes and sacrificed bonuses in recent years to help safeguard the future of the factory. 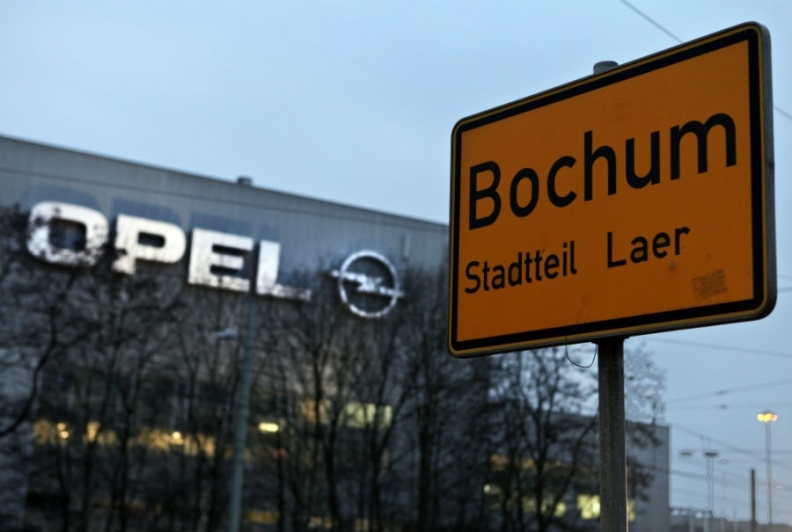 Bochum, which produced its first Opel vehicle in 1962, the same year that construction of the Ellesmere Port factory began, has 3,100 employees, versus a peak of more than 20,100 in 1979, according to company figures. The Vauxhall site has 2,100, having had a workforce of more than 14,000 until the 1980s. In addition to Bochum, Ruesselsheim, Ellesmere Port and Luton, Opel has two more plants in Germany, two in Poland and one each in Austria and Hungary. The largest, in Zaragoza, Spain, was established in 1982 and employs 6,500 people. Further cuts would be pricey and unnecessary, said Opel labor chief Wolfgang Schaefer-Klug, who cited $1.1 billion spent mainly on closing a plant in Antwerp, Belgium. He said productivity would improve if GM implemented measures commonplace elsewhere. Engineering, manufacturing and purchasing could be combined across GM's brands, as they are at the VW, Skoda and Audi units of Volkswagen Group, Europe's No. 1 carmaker, he said, while regional markets should be served by plants in the same areas. Chevrolets currently manufactured for Europe in South Korea will probably be built locally within two or three years, lifting capacity utilization beyond its current 80 percent, he said. The alliance between GM and PSA, which will involve building small and mid-size vehicles together, will heighten rivalry between plants, said Christian Lafaye, an official at the Paris-based FO Metaux union who represents workers at Europe's second-largest carmaker. "It will generate twice the amount of internal competition," Lafaye said. "It will certainly engender fear, particularly at the European sites." Under the accord, GM will take a 7 percent PSA stake, becoming its second-largest shareholder. In a joint statement the pair said the alliance "enhances but does not replace" independent efforts to lift margins at European operations. Opel's works council said it sees "opportunities and risks" from the PSA tie-up, with more scope for joint purchasing and powertrain and engine developments, and a danger of cost escalation from increased engineering complexity. Opel/Vauxhall should be given "freedom" to help shape the alliance, it said. About 40,000 jobs at local suppliers are dependent on the Bochum factory, according to a study by Aachen Technical University's Institute for Cars, while local businesses say the pinch is already being felt as autoworkers rein in spending. In Ellesmere Port, Mal Buckley, who has run the Starlight Electronics market stall for 10 years, said closing the plant would be a blow for a town short on other industry. "There's nothing else to support people," said Buckley, whose stand is within yards of two of the town's eight pawnbrokers. "There's not a lot of money, so it's very difficult. People are buying the essentials and that's about it."